In medium nonmetal bowl or 1-gallon resealable food-storage plastic bag, mix all ingredients except pork. Add pork; turn to coat. Cover dish or seal bag; refrigerate at least 4 hours to marinate. Soak wooden skewers in water for 30 minutes. Heat gas or charcoal grill. Thread pork evenly on skewers; discard marinade. Place kabobs on grill. Cover grill; cook over medium-high heat 12 to 15 minutes, turning once, until pork is no longer pink in center. 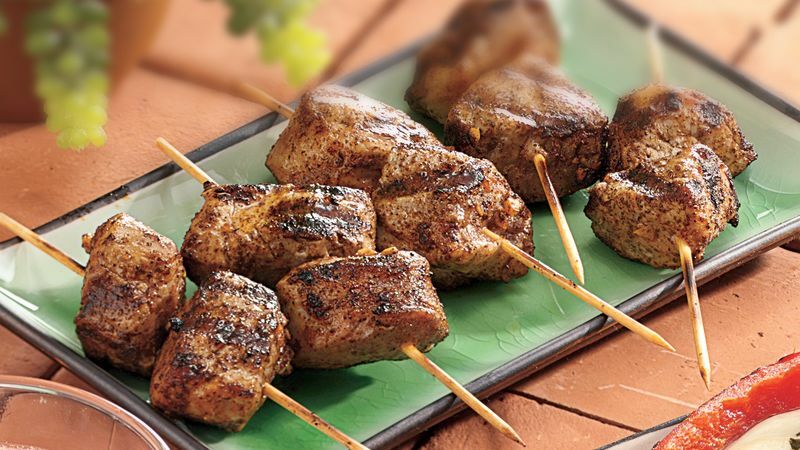 Soak wooden skewers to keep them from burning on the grill. A pie plate or baking pan is perfect for soaking the skewers. Metal skewers can be used in place of small wooden skewers. Assemble the kabobs in advance; cover and refrigerate them for up to 3 hours. Increase grill time by a few minutes.